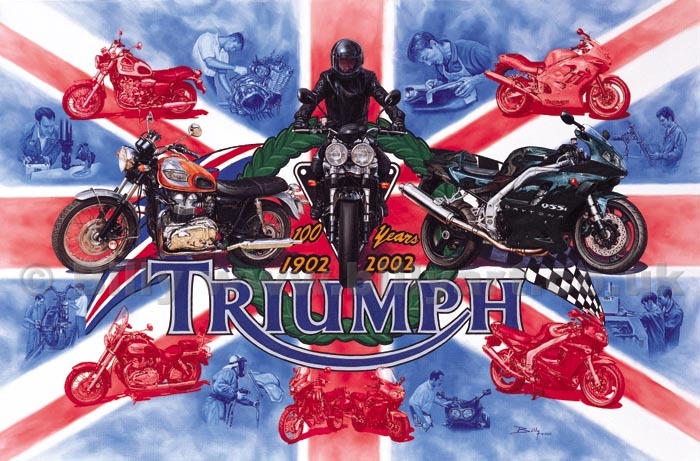 This 'Triumph 100 Years' painting by Billy was produced to celebrate Triumph Motorcycles' centenary year in 2002. The Image is based on the Union Flag with scenes of the Triumph Motorcycles' workforce performing various stages in the production of these classic Triumph motorcycles in monochrome blue. The Triumph Motorcycles' model range from 2002 is encompassed in monochrome red around the outside with the Two centenary Triumph Motorcycles models (T100 & Daytona) flanking the beastial Speed Tripple (I am on the bike!) coming straight out of the centre of the painting in full colour. Thanks go to Triumph Motorcycles dealer BS Bikes too for the loan of all the Triumph Motorcycles for the painting. Bob and the staff were great in helping in the production of 'Triumph 100 Years' by wheeling out all the Triumph Motorcycle models required for the painting. They have an 'Artist Proof' of 'Triumph 100 Years' in their Triumph Motorcycles showroom. 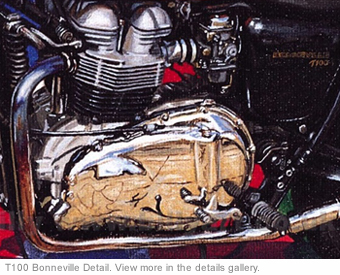 The original painting of these Triumph Motorcycles was produced in oils on canvas and took over two months to produce. The attention to detail on this painting of these wonderful Triumph Motorcycles is stunning and you can see them in the details gallery. This is not a Triumph Motorcycles factory official product but an appreciation by Billy of the wonderful Triumph Motorcycles.